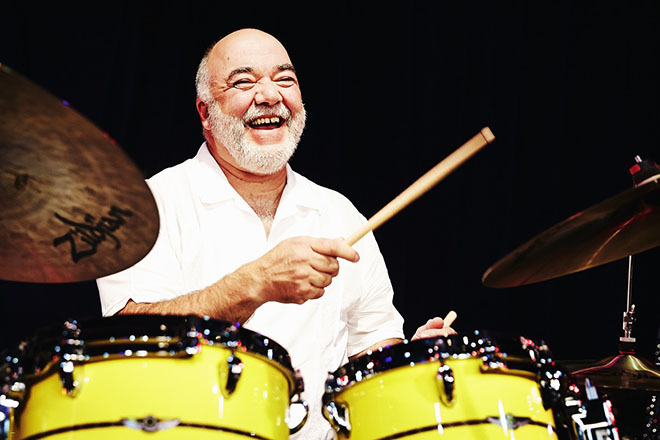 Critically acclaimed and celebrated drummer Peter Erskine has played the drums since the age of four and is known for his versatility and love of working in different musical genres. He has appeared on over 600 albums and film scores, and has won two Grammy Awards, as well as an honorary doctorate from the Berklee College of Music. Erskine has had over 50 albums released under his own name or as a co-leader. 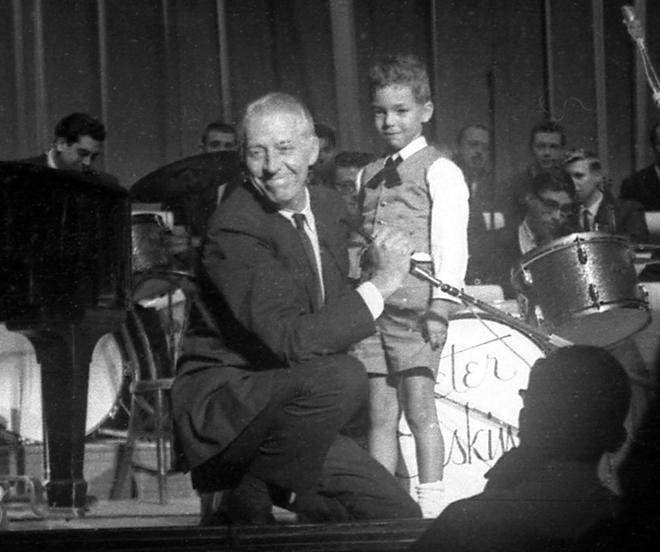 In 1972, he joined the Stan Kenton Orchestra at the young age of 18—and played there for four years. He then joined the Maynard Ferguson Big Band for two years. In 1978, he became a part of Weather Report, joining Jaco Pastorius in the rhythm section—and moving to Los Angeles. He was with Weather Report for four years and five albums, and won his first Grammy Award with their album 8:30. He also worked with Jaco Pastorius’ big band Word of Mouth. Erskine then moved to New York City where he worked for five years with Michael Brecker, Mike Mainieri, Eddie Gomez and Eliane Elias in Steps Ahead, John Scofield, Bill Frisell and Marc Johnson in the legendary group Bass Desires, John Abercrombie Trio and Bob Mintzer Big Band. His recordings with Mintzer are modern big band/funk performances studied by many drum students. Living in Los Angeles since 1987, Erskine has traveled the world, working with artists as diverse as Joni Mitchell, Steely Dan, Pat Metheny, The Yellowjackets, Gary Burton, Jan Garbarek, Diana Krall, Kate Bush, Nguyên Lê, Rita Marcotulli and Sadao Watanabe. Erskine won his second Grammy Award as the drummer of the WDR Big Band Köln along with Michael Brecker, Randy Brecker, Vince Mendoza and others for Some Skunk Funk. Keeping busy in L.A. with artists Alan Pasqua, Bob Sheppard and Bob Mintzer, as well as playing in studios, and on films where Erskine’s drumming can be heard on Memoirs of a Geisha, the new Pink Panther films, all three Austin Powers movies, and the title music of the Steven Spielberg/John Williams collaboration The Adventures of Tintin. 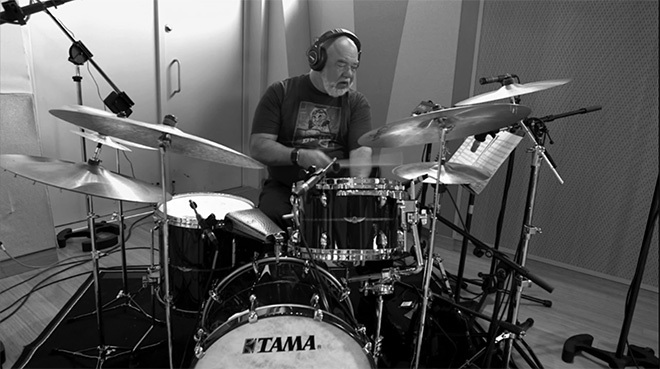 Peter Erskine’s February 2017 release, Second Opinion is the follow-up release to his Grammy-nominated “Dr. 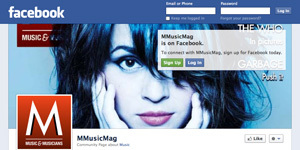 Um” album, reuniting the production team of Erskine with Grammy-nominated keyboardist and arranger John Beasley. Second Opinion is just that: a new look at songs and genres that are ripe and begging for expert musical attention. 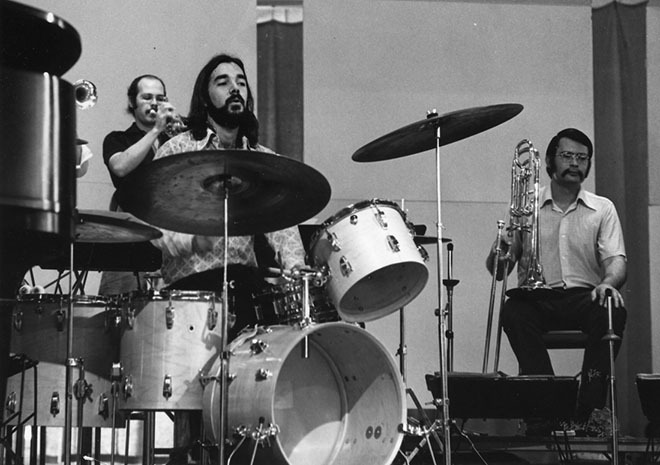 From funky originals to Henry Mancini covers, the Dr. Um Band delivers—featuring Peter Erskine on drums, John Beasley on keyboards, Bob Sheppard on sax, and Benjamin Shepherd on bass. This new album, which Erskine calls “his best album yet,” was recorded at Sweetwater Studios, engineered by Mark Hornsby and mixed by Talley Sherwood. 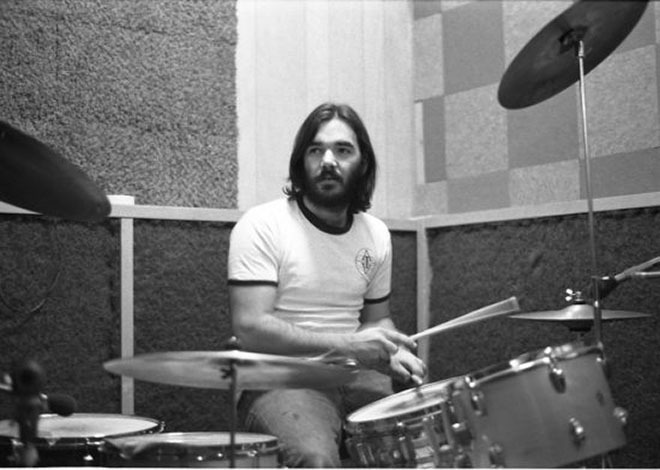 Peter Erskine is one of the most respected and melodic drummers. He has a rich history of playing drums with a wide range of musicians. He spoke with us last month from his studio in Los Angeles about his recent album recorded at Sweetwater Studios in Fort Wayne, Indiana—and about the art of listening. How did the album Second Opinion evolve? The first album, Dr. Um and the Lost Pages, was a result of constant prodding by my best friend from high school, Jack Fletcher. Years ago he phoned from an airport in Hawaii and said, ‘I’ve got it—you are Dr. Um—and you gotta make a funk album.’ This was when I did ECM-type of work—exploring dynamically soft music—with a lot of open spaces. I termed it an ‘anti-drumming’ approach—not reaching for the playing solutions that the hands would be keen to follow. For lack of a better description—an intellectual approach. John Beasley’s name instantly came to mind. This would be the creative and musical force that I would need to collaborate with. So John and I batted around some ideas. I had long wanted to do a project where I recorded music that I felt was underrepresented or unheard—music that deserved a second hearing—a second chance at life. It began by doing a Wayne Shorter tune from the Weather Report days. Wayne used to bring in these very long complex scores for the band to read. Then, Joe [Zawinul] or Jaco [Pastorius] or both of them would say, ‘Hey Wayne, this thing on page five and six is pretty cool, let’s focus on that.’ So they would excerpt one small part of this grand composition—and that would become a tune. This happened with the song “Sightseeing” from Weather Report’s 1979 album 8:30. I secreted away one of these scores, and filed it away for all these years. In anticipation of this Dr. Um album, I had set it aside. When John came over, I couldn’t find it. I was tearing my studio apart. Meanwhile, I came across all these other pieces of music. And he said, “I have a couple of tunes.” I also had a tune in mind that I introduced at my first ECM album session, and everybody hated it. (Laughs) So, we quickly came up with this idea called The Lost Pages—music that just fell by the wayside. What was the tune that had previously been rejected? “Hawaii Bathing Suit”—I really enjoy it. I tried getting it on that ECM album, and it got rejected. I then submitted it to a Japanese theme park, and they hated it. (Laughs) So, while frantically looking for that Wayne Shorter music, I came across this in my file cabinet, and I thought—maybe this tune will finally get a chance to be played. I love the way it came out—very fun song to play. My experience is a variation of the Vivien Leigh line “I’ve always depended on the kindness of strangers”—from A Streetcar Named Desire. Well, I’ve always depended on the brilliance of other musicians. And these were the perfect guys to do it—Beasley and Sheppard. On the first album, the bass player was Janek Gwizdala. So both albums enjoy the presence of really great bass playing. We mixed it with the same gentleman, Talley Sherwood, who had worked on the first album. What did you learn from the recording experience? We were doing the preproduction while seated at our respective instruments—crafting the arrangements on the fly. I have students working in my studio all the time, and I often advise them: “When you sit down at the drums, don’t worry about moving this part of the kit here or there to make yourself more comfortable. Just sit down and play.” In a larger sense that’s what we did with Second Opinion—we just sat down and made music. It’s more revealing of the way we are. That’s how the album came about. And Second Opinion refers to the fact that it’s a second album, and playing on the whole Dr. Um persona—when you go to a doctor, you want to get a second opinion. Well, here it is. 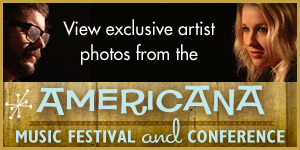 How was your Sweetwater Studios experience—working with Mark Hornsby’s team? What’s unique about Sweetwater is that it’s located in Fort Wayne, Indiana—not at home. You don’t have the distractions of being at home—before you go to the studio doing all the things you do at home—errands or chores, or work-related things you might get involved with, or the temptation of doing something else at night, like take another gig. We were there in the middle of a cornfield, basically, and it’s just the studio and our little hotel rooms. I found the experience similar to oftentimes recording in Europe. Some of my favorite albums were done in these studios that were more or less in the middle of nowhere. Oslo is a bustling city, but when you’re a stranger in that strange land, you confine yourself pretty much to the studio, the hotel and maybe taking a little walk to get some exercise. The same was with one of the other studios used for ECM recordings—Studio Bauer in Ludwigsburg, which is outside of Stuttgart—almost in the middle of the countryside. It’s a distraction-free setting, and you’re there to do nothing else but focus on that music. We don’t have our families, wives or significant others. It’s just you, the other musicians and the music. Mark Hornsby did the tracking. At Sweetwater, we had a room that sounded great, and an engineer who was very keen to show what the studio could do. Sweetwater wanted to capitalize on the music industry connections that I enjoy, namely Shure microphones. We decided to mic the drums essentially with an all Shure setup. Mark added a couple of Royer Ribbon mics because he is very fond of using them in that room. And the room lends itself quite well for Royer. And the Shure folks were cool. It’s basically the same mic setup I have in my home studio. The Shure mics work great. How did you get that amazing sound? We didn’t have the world’s most expensive microphones. These are mics anyone can get. Pretty much the same for drums and cymbals—ones anyone can get. And this is how you make music on these items. It was fun and I’ve always enjoyed that. It’s not fair to call it a limitation, but I like imposing boundaries. I like a canvas that has a specific size. It forces you to be creative within the context of that box or that set of circumstances. It’s a fun way to work. And Mark just made it all sound great. We didn’t have to really think too much about the sound. Would you record again at Sweetwater? I would be very happy to return to Sweetwater to do another recording. In fact, we are going to do that recording residency this summer—for two days. I’m not expecting much in the way of keepers, but who knows. I’m going to sit down at the piano and sketch out some stuff, so we’ll have some new music to record. It’s quite evident in your drumming that you love melody. I like melody, and I think most people do. It’s a musical ingredient that’s easy to overlook if you are not careful. When you start playing your instrument, you’re wrestling with it. Then you start thinking about it—concerning yourself with expectations—the way you should play. Whenever I played to try to meet someone else’s expectation, I was never satisfied with it. It takes time to learn to like the choices I’m making because I’m making them for this reason—as opposed to trying to play for someone’s unknown expectations, to see if I get his or her approval. Ultimately this makes you very comfortable. It also forces you to pay more attention to the music. What we’re all striving for—we all hope for acceptance, but we’re just looking for truth, ultimately. If you can start playing more honestly, musically, it just gets you a little closer to truth. I have no secrets, no philosophy—no one way is better than the other. I just know what seems to work best for me. You teach at USC. Are there common mistakes you see your students making? I see them making the same mistakes I made when I was younger. Jaco [Pastorius] was the one who pointed it out. He said, ‘Hey man, stop thinking so much—just concentrate.’ In music, when you concentrate, it means you’re listening—you’re paying attention. How do you teach students to pay attention? What I tell most of my students at the beginning of their course of studies with me, “Look, we can accomplish everything in one lesson—if you want.’ Their ears perk up, ‘Why? What’s the secret?’ The secret is just play what you’d like to hear. Don’t play what you think somebody else wants to hear. But to do that, you have to be informed. As they study with me for maybe four years, it’s informing them of the possibilities—here are the choices you can make. 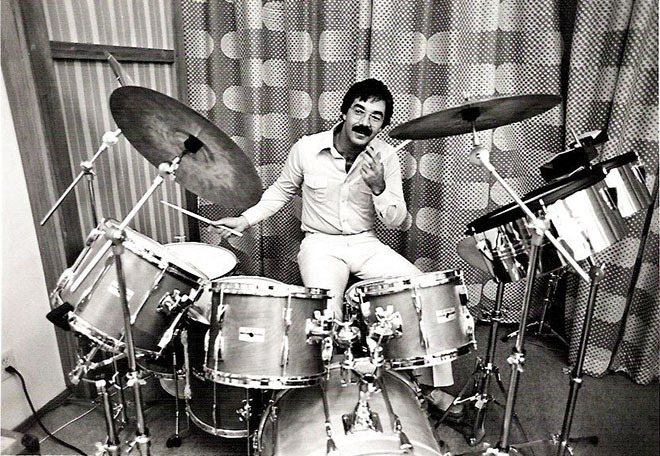 Is there a Peter Erskine technique? I have a Zoom camera and I’m constantly recording them during their lesson. We listen back, and I say, ‘Hey, that’s great. We’re going to make this the first track on your new solo album. Are you OK with that?’ They’ll go, ‘No!’ ‘Oh, do you want to do it again?’ ‘Yeah.’ ‘What would you do differently?’ Then they’ll go, ‘Well, it sounds really busy.’ ‘Why are you playing so much?’ Often times, it’s a sharp slap to the head, metaphorically. Other times, it just starts dawning on them ‘Yeah. I can make some simpler choices here and it will ultimately be better.’ Most of the students that come out of the program at USC may end up finding work pretty quickly because they’ve learned to serve the music. Tell us about playing with Jaco Pastorius. Jaco was really easy to play with. When I heard Alex Acuña and Jaco on Heavy Weather, I told Jaco ‘This is the version of Weather Report I’ve been waiting for my whole life.’ And I thought that was it. Don’t change a thing—it’s perfect, guys. But Alex was leaving the band, so they needed to find someone else. When Jaco heard me, he recognized something that he felt he would be comfortable with. It turned out that one of the drummers I had listened to when I was first going to college was a guy that had worked with Jaco in Wayne Cochran’s band. I think his drumming had an influence on mine. I grew up listening to a lot of the same music as Jaco. We just had common reference points. He liked the way I played. It was Alex Acuna who pointed out to me that a lot of what Jaco played was Afro-Cuban conga patterns. So, if you have any inkling of or like Afro-Cuban music, which I did, then he’s very easy to play with. 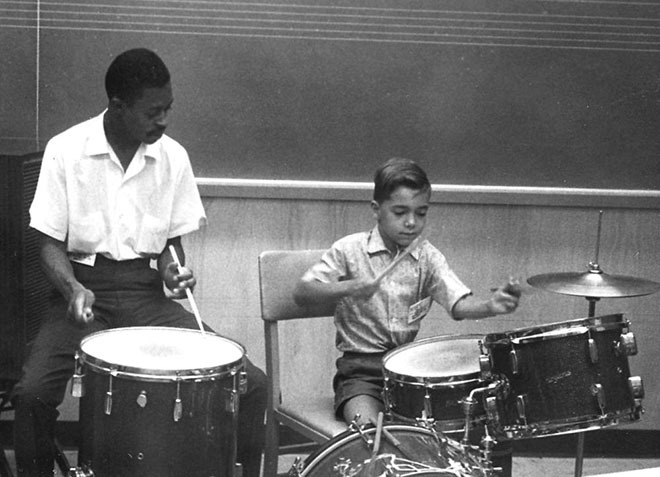 He was super rhythmic—and we were almost the same age. I studied the percussion instruments—marimba, timpani. I play a little bit of marimba. I actually studied trumpet when I was younger, but I gave up because I couldn’t get a sound like all my trumpet heroes on the records—too frustrating. 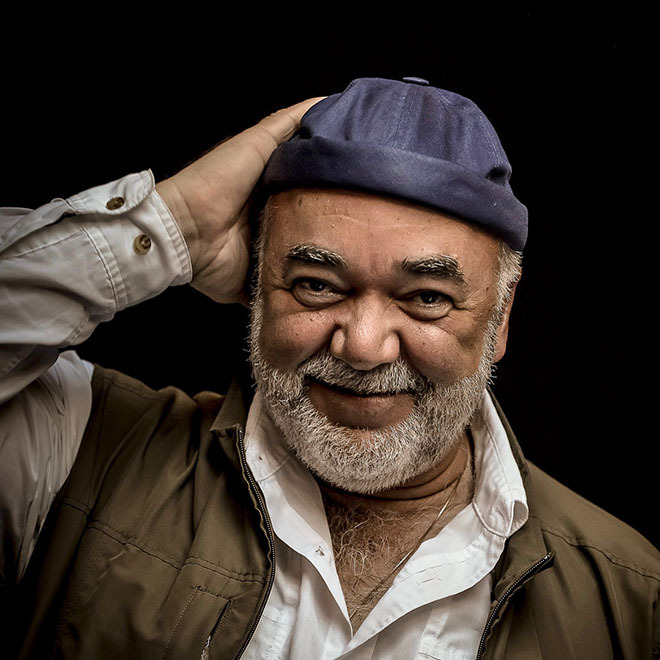 There are two albums we released earlier this year—one is Dr. Um’s Second Opinion, and the other is In Praise of Shadows [Peter Erskine New Trio]. I played marimba on two of those tunes. I enjoy it, and I use it for writing too. I flesh out ideas on marimba. When did you start playing Tama drums? Did you play with Vic Firth? I studied with him, informally, but we’ve known each other for years. I actually met him when I was in high school. We did get to play on a couple of occasions, along with Louie Bellson, “Concerto for Two Drums with Timpani”—back in 1983. Vic and I were friends for a long, long time. I really miss him. The writer Johnny Richards, who used to write for the Stan Kenton Band, knelt down so we were eye level—because I was only 9 years old. He put one hand on each of my shoulders. We were eye to eye, and he shook me very gently—just a little bit. He said, “Peter, be sure you listen to every kind of music.” That was his advice to me. And it was great advice. 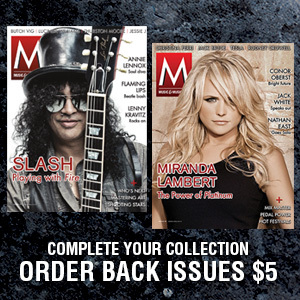 Best advice you’d like to give this next generation of musicians. Listen to every kind of music. Learn to be a good listener. Then, you develop a vocabulary—you’ll know what to play. If you don’t listen—it’s like someone who doesn’t read. And we all now know what that produces. (Laughs) And that’s all I’m going to say about that.